Burundian Peacekeepers of the African-led International Support Mission to the Central African Republic (MISCA) patrol near a barricade of burning tires in the Bea-Rex district of Bangui on May 29, 2014. 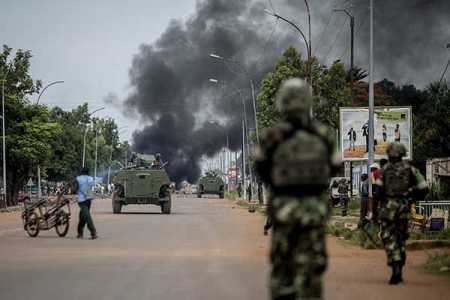 At least 15 people, including a priest, were killed and several others wounded in clashes on May 28 in the capital of the strife-torn Central African Republic, a military source said. Deeply impoverished Central Africa has been in crisis since the Seleka alliance seized power in a coup June 2013 led by Michael Djotodia. Photo –AFP / Lehtikuva. Finland will donate additional EUR 1.5 million in humanitarian assistance for the Central African Republic, where about a half of the population is in need of humanitarian aid, according to a press release of the Ministry of Foreign Affairs. More than 560,000 people have been forced out of their homes. Since the beginning of the conflict, approximately 370,000 people have fled to the neighbouring countries. "The situation in the Central African Republic is extremely alarming. Both the misplaced people within the country and the refugees in the neighbouring countries are seriously under-nourished, and there are no possibilities for food production," said Minister for International Development, Pekka Haavisto. The Finnish donation will be provided through the World Food Programme (WFP). The aid is also targeted for assisting the refugees in the neighbouring countries of Chad, the Democratic Republic of the Congo, the Republic of the Congo, and Cameroon, said the release issued on Tuesday. The aid will be paid from Finland's appropriations for humanitarian assistance, included in development co-operation funding.